This sweet little girl bear is Annie Elizabeth, she is part of our Apple Varieties collection and is 5 1/2" tall. She is made of cream backed, copper gold tipped South African mohair, quite tufted and sparse in texture with a slight wave in the pile. 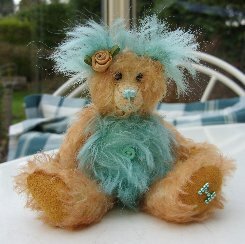 Her tummy and ears contrast wonderfully as they are made of bright hand dyed turquoise German mohair. This fur is very soft and also has a wave in the pile, the pile is longer than on the copper coloured fur. They look great together and make Annie Elizabeth a very colourful little girl. Her nose is stitched in turquoise thread, she has a pretty gold ribbon flower over her right ear and has shiny black German glass eyes. We have filled her with steel shot and steel balls so she is nice and heavy for her size and her pads and paws are made of copper gold ultrasuede. I really like this little girl and I hope you do too, she costs £40 plus postage. Please note that as with all our bears, Annie Elizabeth is not a toy and is not suitable for children.